The troubles of the modern world, reflected in a thrift-store mirror with a gilded frame. Like their Portland, Oregon compatriots, The Decemberists, Norfolk & Western create shimmering pop songs that are smart, orchestral mini-masterpieces. 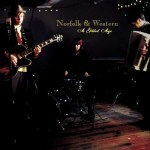 They tour with a scratchy, old 78-rpm gramophone, and provide plenty of dusty, crackly atmospherics on A Gilded Age. There are plinking banjos, sonorous string sections, huffing accordions, buzzing musical saw, thudding tympanis, swirling wurlitzers, mysterious bells, midnight-lightning electric guitar overtones, and, of course, the requisite mellotron and glockenspiel. What emerges most on their new album, though, is the craft behind the songs. There is a subtle politics to this record, expressed in graceful melodies, thoughtful arrangements, and quiet lyrical observations rather than harangues to the barricades or self-righteous denunciations. Instead of rage, a sadness pervades the band's reflections on our new Gilded Age. This album hints at new lives of quiet desperation being lived under the radar of the War on Terror. In "Porch Destruction", for instance, an aged couple in Washington, DC disappears from their condemned Victorian house when a demolition crew appears. From across the street in his row house, the singer develops a "brand new view": not only on the city lights he will now be able to see, but also on the destruction of a home and its mysterious but beautiful occupants. The violin climbs scales, like a wrecking ball lifted up in the air on a rope, poised to swing, until the collision occurs, and electric guitar explodes into splinters and ruin. "Clyde & New Orleans" tells the tale of Clyde Davenport, sentenced to life in prison for the 1962 Ku Klux Klan murder of a young black man in New Orleans. A few days after his arraignment, Katrina swept through the Crescent City, which Clyde took to be God's punishment for his trial when he heard various fundamentalist Christians on the radio arguing that Katrina was God's wrath inflicted on New Orleans as a city of sin and inequity. The song condemns neither Clyde, nor the fundamentalists, which would be easy to do. Instead, Norfolk & Western present us with the story and lets it weigh on the listener uneasily, especially when the music breaks loose into pain as the waltzing rhythm gives way to a Dixieland horn jam gone John Coltrane. Other songs tell tales of loneliness and isolation and the yearning for connection. "A Voice Through the Wall", for example, paints a scene of two neighbors who record each other singing and playing guitar through a shared apartment wall without ever meeting. This sense of connection without community, of making musical love through the walls, haunts A Gilded Age. There is a continually startling contrast between the music and the lyrics. The songs are beautifully recorded and bear the mark of musical collaboration in the careful arrangements and thoughtful ensemble style. But the lyrics are melancholic, solitary, tight-lipped, afraid, removed, alienated. Are we all together now, or am I all alone in my room? Norfolk & Western never choose. The uneasy combination of sophisticated musical connection and simple, lost voices -- of a highly-functioning sonic community whose singers nonetheless seem isolated and without hope -- makes A Gilded Age an album of tense, taut, ghostly music. The phantom of shared communion appears, a spirit glimpsed fleetingly in an antique-shop mirror. But then it vanishes again as a Hummer SUV suddenly passes through the gilded frame. The Hummer's growl out in the street skips the record on the victrola. Its rumble knocks the model train off the shelf. The SUV's death rattle breaks the mirror into fragments. Alone, their voices give up, but together on A Gilded Age, Norfolk & Western stubbornly, solemnly, and bravely try to piece the glass back together again.